When the previews for Guardians of the Galaxy started showing up in theaters, I was struck by the ways they used Blue Swede’s “Hooked on a Feeling.” That song was a nutty novelty hit when I was a wee lad in 1974, and I wondered if anyone else in the theater even remembered the recording, much less felt the sense of nostalgia I did when I heard it. Would people think that “Hooked on a Feeling” was some kind of message from another planet? What could its inclusion in the trailers for a Marvel movie possibly mean, except that, obviously, Guardians of the Galaxy was not a movie to be taken entirely seriously? And yet, that song, and the aesthetic choice that led to its inclusion in the movie, is a key part of understanding the appeal of not just Guardians but of the entire Marvel Cinematic Universe project. Make no mistake: Marvel Studios is, as we speak, creating a pop-culture monument unlike anything that has ever been attempted in the American arts. People have made movies before, and people have made studio franchises before, and people have spent lots of money on big-budget spectacles before, but no one has ever created a chain of big-budget spectacles that are only glancingly related to one another, had two or three of them come out every year, and had every one of them, from the most “branded” of them to the least, emerge as must-see entertainments. It’s a model of production that would have been thought insane ten years ago (and most certainly was). When I was a pimple-faced teen, Star Wars was the biggest hit in Hollywood history, and it still took three years to get a sequel into theaters, and then another three years after that to “complete the trilogy.” And then it took another sixteen years to get “another Star Wars movie” into theaters. And that’s with a filmmaker who had something everyone wanted to see! Imagine if Marvel Studios had moved at that pace. It’s only been six years — six years! — since Iron Man, and Marvel has produced and released ten movies. The least of these movies are still watchable entertainment, and the best of them sing and shimmer with joy and life. None of them are “cheap knockoffs,” none of them are “B projects.” Every one of them has been crafted with utmost care and affection. And yet, here we are, thirteen or so years later, and a movie called Guardians of the Galaxy, based on a comic I’d never heard of before I saw the first trailer, is poised to clean up at the multiplexes this weekend, the tenth – tenth! – movie in a cinematic universe that is only just now getting started. James Bond has been running for 50 years now on a basis of fourteen novels and a handful of short stories. Marvel Comics has hundreds of characters and thousands of stories to draw from. We are living in the true Marvel Age. For another angle of perspective: when I was in my 20s, Tim Burton’s Batman was, yes, the biggest hit in Hollywood history, and shed new cinematic light on a character who, for the moviegoing audience, had been shrouded in camp since his inception, and blew the possibilities of comics adaptations wide open. Batman had a huge budget for its time and reaped huge rewards, and yet, where was Warner Bros in exploiting the DC library and creating their own cinematic universe? Instead, it took three years for another Batman movie to make it into theaters, and another three, and another. It took until 2006 for another Superman movie to emerge, and the only Batman-spinoff project (if it can even be called that) was the disastrous 2004 Catwoman, a movie that had no love for, or even passing interest in, its source material. I was working on a Wonder Woman script while the Catwoman folk were working on their Catwoman script, and I can tell you, there was no one in Hollywood who had the slightest interest in “honoring the source material,” or even respecting it. It was a weird time, no one in power could see what Kevin Feige at Marvel saw. What did Mr. Feige see? Well, that brings us back to “Hooked on a Feeling.” “Hooked on a Feeling” was a novelty remake of a straight pop song. It was an intentional piece of junk culture, a song that said “I know this is dumb, but I like it.” It disarms the listener with its absurd introduction, and then delivers a straightforward love song. Since Watchmen, comics readers have been insisting that comic books are serious literature, to be measured alongside Ulysses and The Iliad, alongside Shakespeare and Tolstoy and Bergman. But let’s be real: comics are junk culture, just like movies are junk culture, and one of the reasons it’s been difficult for WB to create follow-ups for the Christopher Nolan Batman movies is because they take themselves so damn seriously. Where is the joy in a movie like The Dark Knight Rises or Man of Steel? Batman, no matter how “gritty” and “realistic” you make him, is still a guy who dresses up like a bat and punches criminals because his parents are dead. Marvel Studios, from the beginning, had no interest in that level of literalness, the most serious of their movies deliver their seriousness with a wink, and the least serious (and I think Guardians certainly qualifies) are stuffed with joy and love. There is a moment half-way through Guardians where the protagonist, an Earthling, tells an alien a “folktale” called Footloose, a tale that involves the great hero “Kevin Bacon” and his quest to make an entire city learn the joy of dance. The notion of Footloose being a folktale is a key concept for Guardians, and it’s linked to “Hooked on a Feeling” and the other songs that the protagonist carries around with him on an ancient cassette tape in an even more ancient 1980 Walkman. To say more would be to type a spoiler, so I will just say that songs on the protagonist’s Walkman are his link to home, and the key to his soul. “Hooked on a Feeling” and Footloose are both proudly junk culture, because while Shakespeare may edify us, junk culture is what we love. Marvel comics, and the MCU, are proudly and joyfully junk culture, because they know that junk is what we love. Junk culture takes us home. Why does junk culture take us home? Because even if you grew up in a house where your parents took you out to museums or the theater or made you read Dostoyevsky, you still had to do something to absorb that culture, you had to “go to the theater,” and maybe even dress up for it, the way you had to dress up to go to church (another “high culture” ritual), or you had to sit down and set aside time to read that special book with the “big ideas” in it. Whereas junk culture is simply the stuff that’s sitting around freely available, the TV and the comics and the radio. High culture may elevate us, but junk culture is where we live. There is a built-in nostalgia for a song like “Hooked on a Feeling,” a kind of homesickness and a yearning for a return to innocence, where we could play and make up stupid stuff and it was joyful and beautiful because it was fun and sincere. That feeling, I would suggest, is also the joy that comics, and especially Marvel comics, bring us as well, and whether “Hooked on a Feeling” brings us pangs of nostalgia or not through familiarity, we know what it means to play. Which is why the song, and the Walkman, and the cassette, are such key elements to both Guardians and the MCU: whether we grew up on this stuff or not, we recognize the joy of junk when we see it. Guardians, like “Hooked on a Feeling,” has a ridiculous outer shell and a straightforward message of love at its center. Its primary narrative device is a high-stakes/low-stakes comedy, where one character says “Behold, the Vast Power of the…” and then somebody else makes a smart remark and deflates the pomposity. It mocks the very idea of comics being “high art” and cheerfully makes its cast the class rebel pitching smart-alec remarks from the back row. Its deflationary attitude is a cover for its sincerity. America, I would argue, creates junk culture like nobody else ever has. We kind of invented junk culture, and some of its key vessels, like movies and pop songs and superhero comics. What Marvel Studios is creating is a monument to that culture, a gigantic, big-budget, all-tentpole-release-schedule monument that is as daring as it is revolutionary, and as revealing and honest about America’s place in world cultural history. 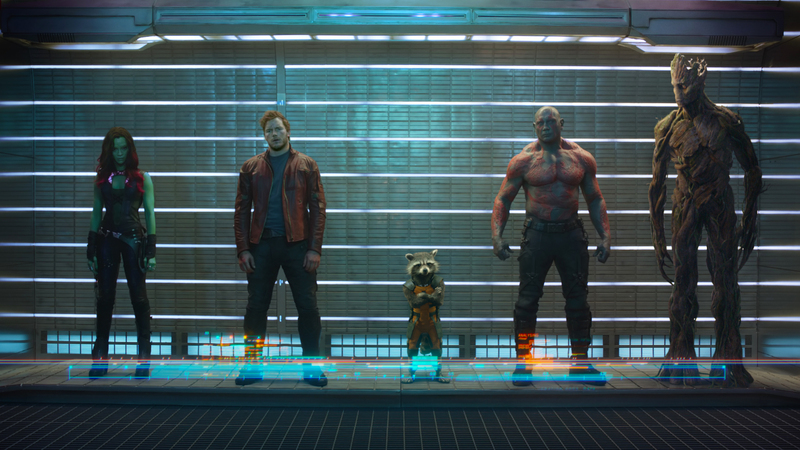 If the use of the Blue Swede song in the trailer wasn’t a stroke of genius, it was something very close to it. I’d heard of the movie before, and was vaguely aware of the comic, But once the song’s ridiculous hook started to play, I was … hooked. Of course, “Hooked on a Feeling was already in my hindbrain; I was fifteen when it made the charts and was put into heavy rotation. 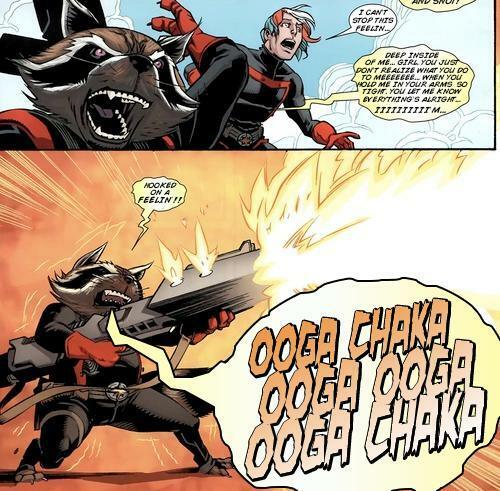 It’s worth pointing out a lot of movie fans associate ‘Hooked on a Feeling’ with its presence on the ‘Reservoir Dogs’ soundtrack, and its use in Guardians signals that the film has an appreciation for Tarantino-like pop culture footnotes. Interesting, Ethan. Do you know when that particular issue came out? I sat up when I heard that song in the trailer: a reminder of a junk genre film (the heist gone wrong!) that gets played very seriously but with a lot of love for the junkiness involved. And then I further sat up when the song got remixed into that one beat into the action sequences. Which was really interesting to me since the trailer didn’t focus on anything but tone: humor and action. It’s not a promise that you’ll walk out of the film talking about premise, but that you’ll enjoy the experience while you’re there. Dammit, I was with you until you stated “comics are junk culture”. No sir, “comics” are a publishing format. They are capable of telling ANY story, both profound and profane. Just because a story is told with words and no pictures does not make it “literature”, and just because a story is told with pictures and words together does not make it “junk”. That’s very true. I should have stuck with “superhero comics.” Or, more specifically, Marvel comics, an art form where their lack of pretension is built into their very formulation. DC was always about the untouchable gods, but the Marvel gods are household gods, the gods you can hang out with and be friends with. Superman lives in a Fortress of Solitude, Peter Parker lives in Queens. I’d like to point out for a minute that what constitutes “Junk culture” from “high culture” is almost exclusively time. Shakespeare in his day was considered a purveyor of base culture. His plays were raucous, humorous and full of all the naughty things. Regular shmoes went to see his plays and laugh along with the humor and boo at the villains. The Medieval poems like the Song of Rowland and Beowulf were basically the superheroes of their day, using their gifts to slay the mythical monsters that beset the regular folk. Hell, the tales of the Greek Gods were half religious, half tabloid gossip – and I mean how they were treated by the populace, not the specific content. That said, I do often wonder what time will make of the American superhero comics of the 20th century. At some point, will people think that Batman was, in some way, a real guy? Greek mythology folk (and there are a lot of them) get really really picky about whether a movie is telling “the real story” of Hercules (to speak only of Hercules), forgetting that there never was a Hercules, and even in the time “those stories” were written, we’re still talking about hundreds of years of literary history, there’s no “one story” of a character as popular as Hercules. And, let’s not forget, “comics canon” gets decided upon by the readers, not the publishers. Time and quality and popularity decide what the “official story” is on one character or another. Superman didn’t even have an origin story when he first appeared, the writers made it all up as they went along, dropped things that weren’t popular and accentuated things that were, then radio and film added other things, and on and on. While I agree that some art is made specifically for “smart people” to appreciate, that usually only extends to recreations of an art form that has since become classic. Opera was considered tawdry when it first appeared. Now if you write an Opera of course you will write it thinking it should only be for “smart people” because time has changed it thus. Organ music was considered immoral and base because it began in cheap theater – of course time changed that. Medieval art varies. Some were promoted by a specific lord or lady, or whatever – though patronage was more a Renaissance thing – but just as much was meant to teach the plebes the bible stories through easy to understand pictures. I’m not saying that some people don’t make “high art” for the sake of it being some exclusionary and pretentious self-congratulation. Of course that happens. Certainly. There will always be somebody who wants to make something that is “better” or “higher” than that around them. But that is in their minds, not the future’s. Will their “High Art” even be remembered in a few hundred years if nobody sees it to enjoy it? Give it a hundred years and “base culture” may well be treated with reverence. We don’t even have to fast forward a few hundred years to see the process taking place. Charlie Chaplain in his day was just a silly actor in silly little movies. Today they are considered classics in their own right. Elvis was nothing more than a flavor of the month girl-swooner who was downright base with those damned hips. Today, he’s the beloved King of Rock and Roll, a classic. The original Star Wars trilogy is today, among many of the younger set who only saw it decades after it first hit theaters see it as an old classic film, which probably comes as quite a surprise to adults who went to see it as a simple pop-corn flick when they were their kids’ ages. I’m not saying GotG will stand that test of time, as much as I loved it. Maybe the things I mentioned above won’t last as long as some of the things we’ve mentioned before. But time gives gravitas to things, and even what someone in the present may consider “junk culture” may be treated differently in the years to come. Not to mention, history changes these things sometimes within living memory. In our time, the real achievements of, say, Jack Kirby, are lost on the movie-going audience who applauds at every appearance of Stan Lee in a Marvel movie. To them, Stan Lee is Marvel, and this brace of movies will most likely stand as a complement to his vision, Marvel Comcis writ large, 5¢ comics turned into $200 million movies. There is a popular narrative circulating about how “DC is broody and over-serious” and “Marvel is simple comedy and action,” which I think is overblown. SUPERMAN emphasized comedy and SUPERMAN II was torn from the hands of Richard Donner and placed in the comedic hands Richard Lester ( A HARD DAY’S NIGHT). On the other hand, Marvel’s first foray into the cinematic success was really BLADE, which couches the vampire mythology in the contemporary landscape of a virus, like AIDS. I’m not arguing Mr. Alcott is getting anything wrong, but I am pointing out that the current narrative of “how to comic movies right” is a constantly shifting target. Marvel is now managing the past success of other good movies. Well, the Superman movies of the 1970s and early 80s were a completely different studio regime. The rise of the “DC serious / Marvel funny” meme comes purely from the 21st century, although the Burton Batman movies were considered deadly serious in their time. I would note that while yes, Marvel is doing this–making the mega-franchise–it’s also to a non-negligible extent DISNEY that is doing it. Disney is planning to do the same thing with their Star Wars franchise and is looking at replicating that success intentionally. It will be *fascinating* to see if they are able to. If they are … it’ll be a new age in film-making as other owners try to replicate that concept. When Alien 3 came out I was extremely disappointed. It wasn’t because it was necessarily a *bad* movie (even then I could see a defense of it)–but because it was definitely not ‘protecting the franchise.’ It was taking a innovative / ultra-intense (which isn’t a strong enough word) horror movie which was then multiplied by an innovative / ultra-intense war movie and then … dropping the ball. The production values weren’t there. The innovation wasn’t there. Killing off the Aliens characters seemed small-minded. Killing off Ripley was fine (if I’d had the Aliens-3 franchise I’d have written out the Aliens characters altogether) as it went but it just felt like Weaver was going “I’m done with this nonsense.” It gave us a new Xeno-form (showing they could inhabit other things and mold off them)–but mostly? It didn’t expand the universe at all. It didn’t do anything with the stakes. It didn’t give us new characters we felt strongly about (something the first two did). In other words, it felt like a movie the studio *had* to make–but didn’t care much about (and yeah, I knew it was in development hell)–but I was still outraged: Why would you take a world class franchise and then make one (and later 2) second-rate movies off it?? Why wasn’t there a ‘steward’ attached to each franchise whose job it was to protect them (I discovered later that Star Trek had exactly that–and while it outraged many fans, I still felt it was a good idea in theory). Marvel has hit on this (although it appears that Kevin F. might be some kind of mutant super-hero whisperer that no one else can imitate). I wonder what Disney will do with their Star Wars stuff. This is one reason I question Abrams as the steward for the next 3 Star Wars movies: he’s a pretty decent choice for the job (his reboot of Star Trek, while not perfect, captured the Kirk-Spock-McCoy chemistry that was all important so he *got* that)–but he’s probably too big to control. Arguably Whedon was / is too big to control and he did a bang-up job with Avengers–but Whedon is a fundamentally different kind of story-teller than Abrams is and Avengers is a fundamentally different (and probably far, far more complex) kind of story than the Star Wars second-franchise will be. Good article. I do think that calling super hero stories junk culture is an unfortunate naming–but it’s key to note that most of the Spiderman movies included the dismal aspects of Peter Parker’s life adding ‘marital strife with his girl-friend’ and largely omitted just how fun it would be to actually be Spiderman (and when he is enjoying it, it’s not shown as being too cool for him to do it). That ‘joy’ *is* what the non-Marvel movies often miss (the family arguments between Mr. Fantastic and his wife were a jaw-droppingly bad focus for the first FF movie). I would also add this comparison. Marvel seems to understand their own characters and stories, while DC, as it’s currently constructed, does not. Was I the only one who cringed when the DC bosses publicly announced, upon the success of Dark Knight, that Superman would now be dark too, since that seems to be the secret to doing superhero movies? I’m not sure what’s going on vis-a-vis DC/WB. I know that when I worked on the Wonder Woman movie, back in the days of silent cinema, the producers wanted to make her a black-leather-clad CIA agent who isn’t from ancient Greece.